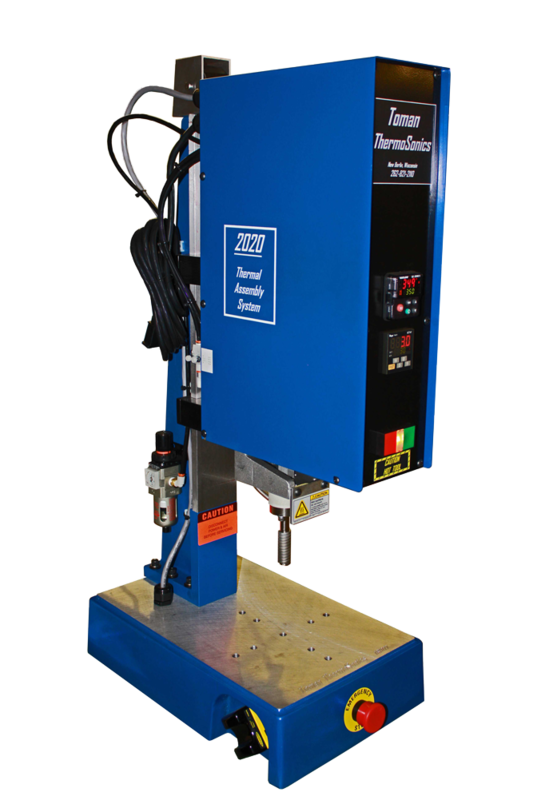 These stand-alone pneumatically-operated, 2020 Basic & 2020HD bench top assembly systems develop 120 pounds of down force and are ideal for smaller inserts or stakes up to 1/4″. The 2020HD (Heavy Duty Series) produces 500 pounds of down force and can do several stakes or inserts up to 3/8″. Both models come with the added benefit of easy head height adjustment (from 4″ to 16″). The head has a pair of column clamp handles and a counter balance spring which make the head both light and easy to move. Simply loosen the clamps and move the head up or down as desired. For a complete Turn Key Solution, let us design and build the tooling for your specific application. All that is required is a PDF of your part drawings, a solid model, and production parts to be assembled. Before we ship your machine, we will run up to 50 assemblies and submit them for your approval. Your machine will be validated with all of the settings for that particular assembly. When you receive your machine with tooling mounted, just plug it into a 120v outlet and supply your shop air. Once the machine is at temperature, you can start to run parts. Maximum Force: 500 lbs. @ 100 psig for the 2020HDStroke length: 4″ (10.16 cm)Weight: 72 lbs.